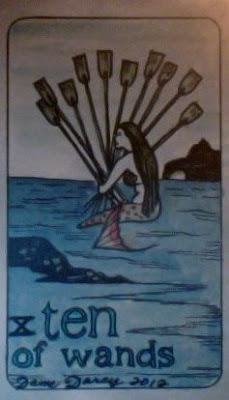 Weekend Reading: Ten of Wands from the Mermaid Tarot. Regular Life + Holiday Planning and Stress = Feeling Overburdened. And with just 10 days before the big day, you're likely to feel that way this weekend. So have a plan in place to do something to take care of yourself this weekend. Make sure you take that bubble bath. Fit in that yoga class. Stop and enjoy a coffee. Do something to equalize that stressed, oppressed and overburdened feeling. Sometimes we invest so much of ourselves in the planning of a holiday that we're too depleted to really enjoy ourselves and soak in the spirit of the season. Pacing yourself and taking mental breaks now will pay off when the holiday comes and you're "there" to enjoy it.